Lisa and I met for coffee in her third trimester with her second child before I relocated to Michigan, as a Michigan birth photographer. She planned on delivering at Baby and Company. We talked about her birth plan and wishes during labor. She wasn't sure about water birth, but she did feel like her baby was going to come fast! I love how Lisa listened to her body when her midwife asked about filling up the tub. Lisa thought it sounded good and she got into the shower while the tub was filling. Even though water birth wasn't what she had planned, in the moment, it was what she wanted. Shortly after the tub was ready and she got in. There wasn't time for much relief because this baby was coming, fast! After a few minutes in the water, she started to push. Lisa move into a position that was comfortable and had a water birth after all. She reached out and caught her baby and he was looking straight at her. It was amazing. He knew exactly who his mama was, and he looked for her. After about an hour his sister came to meet him, she was wonderful and so excited! 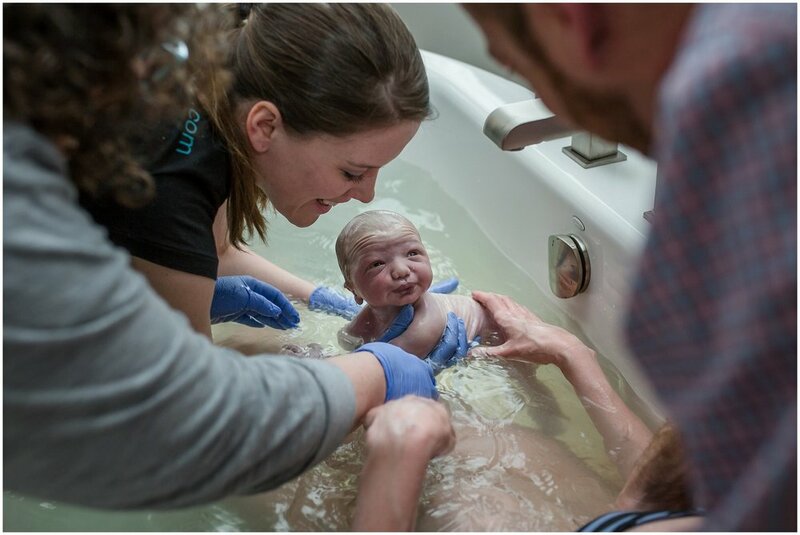 Take a minute to read more about this amazing water birth at Baby and Company. If you are interested in birth photography in Michigan, please contact Jennifer today! She'll be accepting 2 births per month this winter in Michigan. Michigan birth and motherhood photography.